Simple and safe operability, compact design as well as improved performance features were the focus during the development of the new FR-D700 frequency inverter. A drive was created that set new standards in the field of compact drives. Improved functions and device properties such as simplified cabling thanks to spring clamps, the integrated Digital Dial with LED display, improved performance yield in the low-speed range as well as the integrated emergency stop function make the FR-D700 the new standard in the ultra compact class. The FR-D700 is especially advantageous for standard applications by virtue of its user- friendliness. It is the correct choice in both simple and more sophisticated applications. Typical applications are feeder and conveyor drives, machining tools or gate and door drives. This inverter actively monitors its own functional safety. If, for example, the fan rpm decreases to 50 %, a pre-alarm is triggered. An internal measuring program monitors the ageing of the capacitors and an operating hours counter enables the operator to plan the best time for servicing. Protection and overload functions like the phase failure monitoring system for both the input and output circuits ensure trouble-free operation. 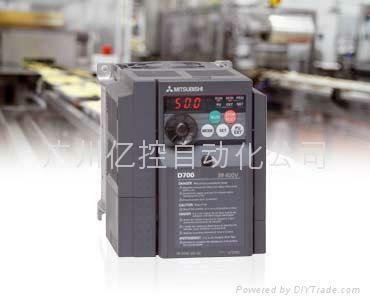 The FR-D700’s OEC function helps to further optimize current and hence power consumption of the motor. The result is an additional decrease in energy requirement compared to a conventional inverter. The FR-D700 is designed for a service life of over 10 years. This is made possible, among other things, by high-performance heat- resistant capacitors, cooling fans with sealed bearings and special lubricating grease. The flow of cooling air comes into contact only with the heat sinks and not electronic components. This ensures that no dust or dirt can collect on the components. The circuit boards are protected against aggressive environments with single or double layer conformal coating – another feature that ensures longer service life. To protect both staff and valuable machinery, the FR-D700 has innovative functions that enable it to respond with great sensitivity to a variety of external factors.